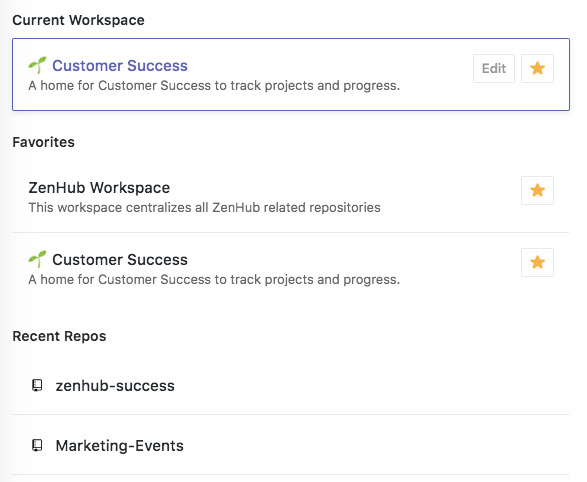 New The ZenHub Reporting Suite unlocks the insights you’ve always wanted from GitHub. Click to read more. These Release Notes are for ZenHub Enterprise, for customers using ZenHub with GitHub Enterprise. For all users using ZenHub on Github.com, please check out our new feature announcements on our product changelog. Below is a summary of the latest enhancements and new features released to ZenHub Enterprise. You can also view more on the next upcoming 3 Releases in our Enteprise Roadmap available here. Have questions or want a 1-on-1 walkthrough of the updates? Send us a note at enterprise@zenhub&period;com and let us know how we can help. We&apos;ll set up a custom walkthrough to help you with the latest updates. For teams working across multiple repos, you can now toggle between which repositories you'd like to select when creating new Issues directly from the new Issue modal. 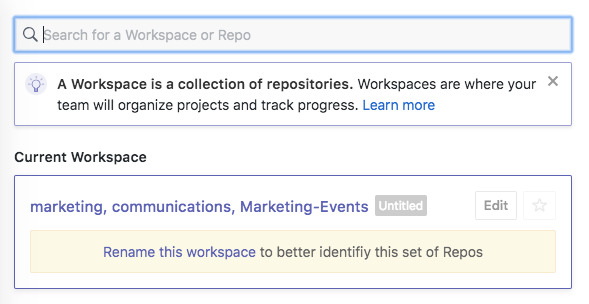 Workspaces help teams better bundle GitHub repositories into a single view, while providing a personalized experience via naming. Previously known as multi-repo Boards, Workspaces give bundles of GitHub repositories names and descriptions for better project and workflow tracking. 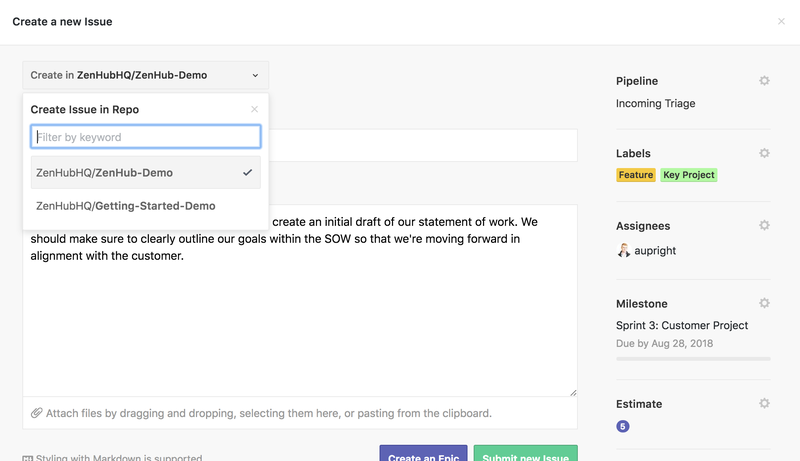 This is the first of 3 phases to introduce new ways of organizing work in ZenHub. We share more about the next 2 phases of Workspaces here. Read the help guide on how to create, name, and organize Workspaces. In addition to naming and adding descriptions to Workspaces, when working in a multi-repo Workspace, there's now a default setting for Issue creation. When creating Issues, regardless of which repo you use to enter the Workspace, New Issues will be created in the default repo set for the Workspace. Issue Creation Bug Fix When adding a file during Issue creation, templates will no longer disappear. Issue Creation Bug Fix If you click Create New Issue more than once it will no longer create duplicate Issues. Bug Fix The Open Issue and Show PRs board settings options will no longer break the ANY filtering on the Board. Bug Fix The menu bar will no longer be pushed off of page when the sidebar is in a locked expanded position. Bug Fix Long names across all Issue attributes (like the pipeline name in the side panel), and all filters now properly line-break instead of overflowing on the page. Bug Fix When changing pipelines in an Issue in the web app, the Closed pipeline is now an option. Burndown improvement Pipelines will now properly appear on the Burndown Issue list. Epic improvement When viewing an Epic in the web app the Epic badge will now appear to help visualize identify the Epic. Error Page UI Enhancements All error pages now properly link to corresponding help articles to help you get back on track faster. UI Enhancement All buttons across the Release report and Burndown have consistent styles. UI Enhancement We updated how images get rendered across the product, which means speadier load times! In addition to the bug fixes and enhancements listed above, here's important admin notes. ZenHub Enterprise 2&period;28 supports the following GitHub Enterprise versions: 2&period;13, and 2&period;14. We have deprecated official support for ZenHub Enterprise versions below 2&period;24. We officially support the following ZenHub Enterprise versions: 2&period;28, 2&period;27, 2&period;24. That&apos;s all for now ✌🏻! Want to be notified when the next release notes get published? Send us a note at enterprise@zenhub.com and we'll follow-up with the latest details once they're available.